Esculin is a glycosidic coumarin derivative (6-beta-glucoside-7-hydroxy-coumarin). The two moieties of the molecule (glucose and 7-hydroxycoumarin) are linked together by an ester bond through oxygen. Many bacteria can hydrolyze esculin, but few can do so in the presence of bile. Thus the bile esculin test is based on the ability of certain bacteria, notably the group D streptococci and Enterococcus species, to hydrolyze esculin in the presence of bile (4% bile salts or 40% bile). Bacteria that are bile-esculin positive are able to grow in the presence of bile salts and the hydrolysis of the esculin in the medium results in the formation of glucose and a compound called esculetin. Esculetin, in turn, reacts with ferric ions (supplied by the inorganic medium component ferric citrate) to form a black diffusible complex. Gram-positive bacteria other than some streptococci and enterococci are inhibited by the bile salts in this medium. Organisms capable of growth in the presence of 4% bile and able to hydrolyze esculin to esculetin. Esculetin reacts with Fe3+ and forms a dark brown to black precipitate. Thus the tolerance to the presence of bile and the hydrolysis of esculin provide the means to presumptively identify organisms. 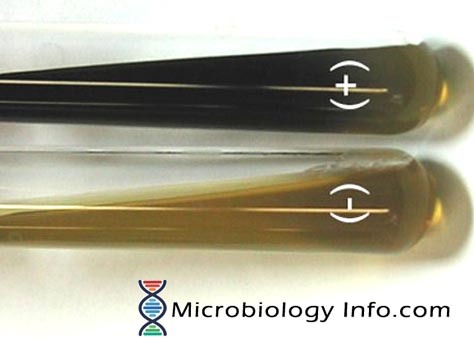 If an organism can hydrolyze esculin, the media will turn dark brown or black. Bile esculin agar is a selective and differential medium which is used to presumptively identify enterococci and group D streptococci based on the ability of an organism to hydrolyze esculin. Beef extract (11 g), enzymatic digest of gelatin (34.5 g), esculin (1 g), ox bile (2 g), ferric ammonium citrate (0.5 g), agar (15 g), per 1000 mL, pH 6.6. Inoculate one to two colonies from an 18- to 24-hour culture onto the surface of the slant. Incubate at 35°-37°C in ambient air for 48 hours. Observe for growth and blackening of the medium. This test is used for the presumptive identification of enterococci and organisms in the Streptococcus bovis group. The test differentiates enterococci and group D streptococci from non–group D viridans streptococci. It should be used in conjunction with other biochemical tests to identify cultures of isolated organism. As a result of nutritional requirements, some organisms may grow poorly or not at all on this medium. Some strains of Staphylococcus, Aerococcus, and Listeria monocytogenes may grow in the presence of bile and hydrolyze esculin. monocytogenes will form minute black colonies. A heavy inoculum on BEA may cause interpretation of the bile esculin test difficult to read. Excess inoculum decreases the ability of the bile to inhibit growth of other gram-positive organisms that may hydrolyze esculin. There are a few streptococci that do not hydrolyze esculin but will grow in the presence of bile. Growth without blackening of this medium does not constitute a positive test. BEA does not contain azide; as a result, gram-negative rods will grow on this medium. Many of these organisms may hydrolyze esculin.